As one of the first countries, Switzerland has made its national decision in mid December 2012. This might be unwise as the time to the Eurovision week is six months! So the winning song could be forgotten at that time or overheard in its own country. 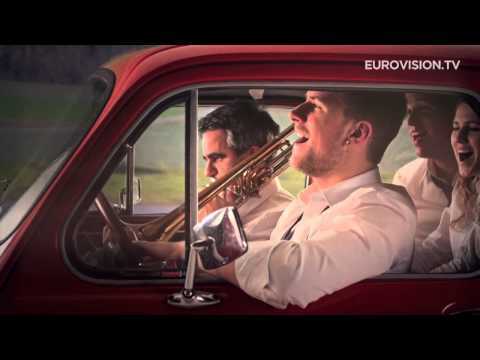 In a big TV show the band “Die Heilsarmee” (Salvation army) could win with the song “You And Me” with 38% of the televotes. The most striking aspect is the name of the band, as this is a political group which says about themselves “Free church with a strong social conscience”. Due to the regulations of the EBU this does not conform and the name has to be changed. As many of you may know people from the Salvation Army are wearing uniforms when they are on the streets. This group has also worn their uniforms on stage already and this will also break the rule in Malmö. The band members do also have on man whose age is 94! The song itself starts with a rocky intro and turns into an anthem, very melodic and catchy. The way the group is set on stage with their instruments has something special. If they do not change everything in their performance, name and outfits then this might do well in Malmö, as this entry is different from what we are used coming from Switzerland. This year Switzerland is taking part for the 55th time in the Eurovision Song Contest. Switzerland is not only one of the founding members of this event it has even won the first contest in history with “Refrain” by Lys Assia in the first year back in 1956. Switzerland has missed out two years 1999 and 2001 due to bad placing in previous years. Since the semi finals have been introduced in 2004, Swiss entries were struggling with the qualification for the grand final. Two years ago it has been the second time to see Switzerland in the grand final again with “In love for a while” by Anna Rossellini, unfortunately she made the 25th place, but at least she has reached the final. The Swiss entries have mostly been sung in French and German language, seldom in Italian or Rhaeto. The most significant winning entry is probably “Ne partez pas sans moi” by Céline Dion in Dublin 1988; she won with only one point distance to the UK. And everybody knows that she started a world career, having sold millions of albums and has her own show in Las Vegas.